A stunning new resort on the northern reaches of the city, Templation is designed to wow. 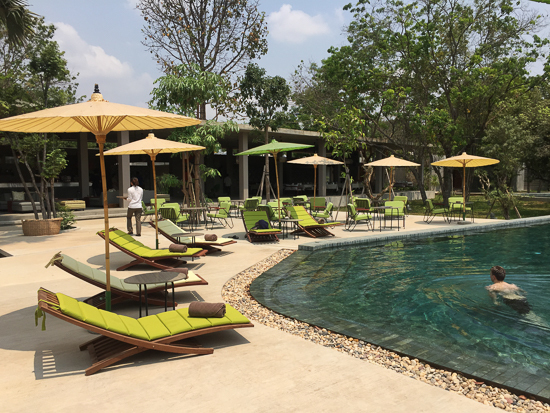 And it succeeds from the moment you pass through the elegant, stone-clad lobby to catch your first glimpse of the enormous pool and extensive gardens, dotted with trees and villas that evoke Cambodia’s romantic heyday. Ad Book now! Rates from US$125++. Average rating 9.2 from 235 reviews. This will be tough to leave. Designed by local architect Lisa Ros — whose work you can also see at Viroth’s Hotel and Villa Ni Say — the resort is set on four acres and subtly generates a romantic, bygone feel that would be recognisable to most Europeans, even those who may never have visited Kep with its beautiful, cocktail-ready villas with their distinctive stone work and classical lines. Private pool suite, with two bedrooms and a living room. The villas come in three styles: pool-view studios, which all open on to the main pool, private pool suites, and private pool villas. Because even with the largest pool in Siem Reap at your feet — it’s 1,000 cubic metres — sometimes you just want to go it alone. 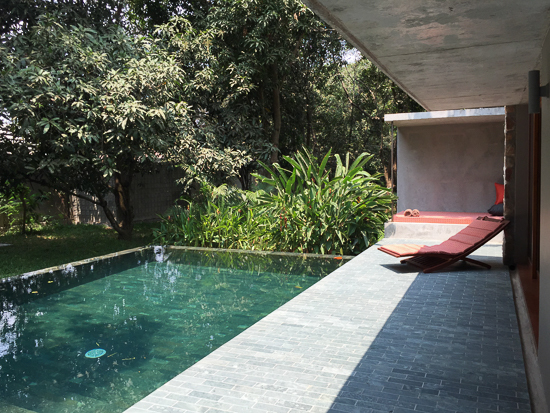 Moreover, the private pools are very often shaded, offering a cooler dip than the main one. Elegance and simplicity in the pool view studio. The sizes differ, but the style remains the same throughout, combining clean and simple lines and backgrounds in soft shades with bright splashes of colou. The effect is elegant and sophisticated. 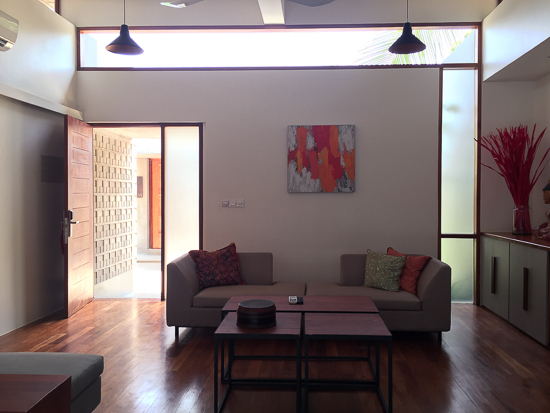 Relatively high ceilings contribute to the sense of airy space. 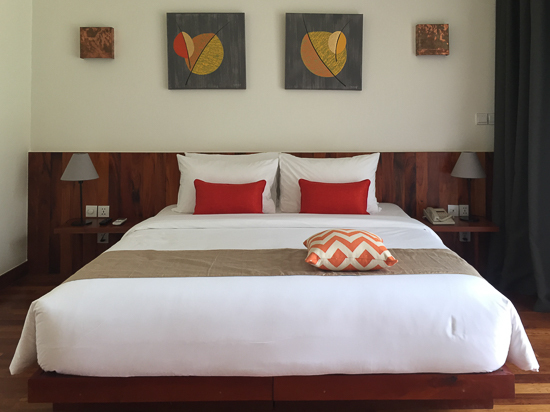 Each bedroom comes with an elegant divan, which is incredibly comfortable — we tried it. Thus the studios can sleep up to three. The two-bedroom suites can take up to four, and the villas up to six guests. Your early morning view from the studio. We loved the bathrooms — and it’s not often we get to say that. Each one is open-air, allowing you to get a truly fresh start to the day. 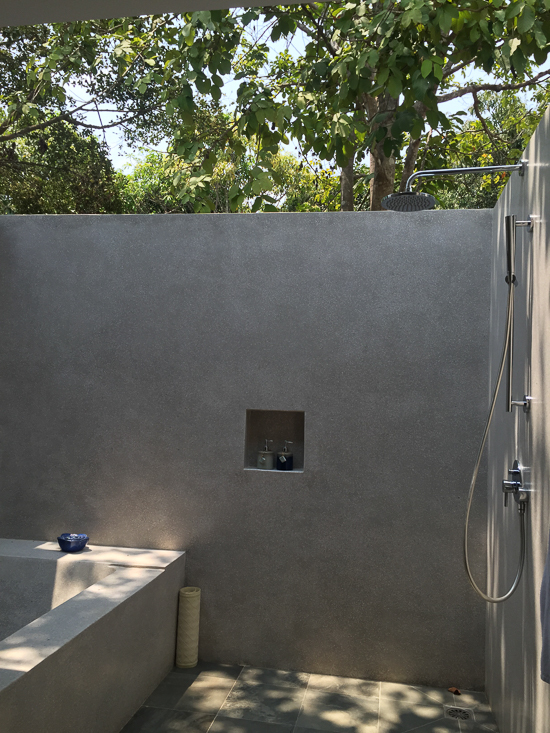 Every one comes with a huge terrazzo bath and rainfall shower, and we have a feeling that these will be most enjoyed when it is actually also raining. 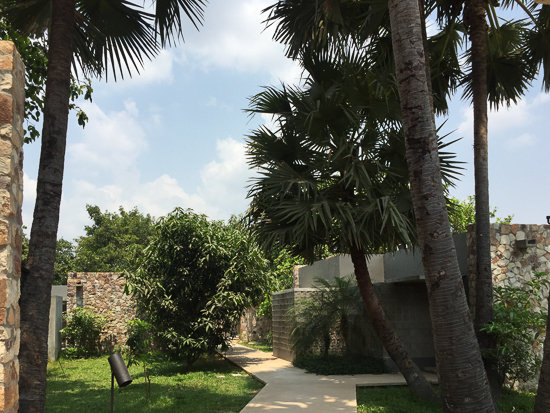 Outside, the grounds are dotted with both original and newly planted trees, with buckets of rumdoul — Cambodia’s national flower — jackfruit, mango, cashew and banana trees providing shelter and a cool, aromatic atmosphere. The pool is overlooked by an open-fronted bar and restaurant terrace, where you can savour a range of Asian and Western dishes, or perhaps a re-imagination of a classic cocktail, mixing in local fruit flavours. Say “Lead me into temptation”. The spa wasn’t open yet when we visited, but will offer massages and the usual array of treatments and therapies. On the other side of the main building, a small air-con gym has a treadmill, cross trainer and free weights. Just beside there, the business centre is open 24 hours. And you’ll also find a small shop with practical items like sunscreen and swimwear alongside locally produced gifts and souvenirs that have strong design values. Combining all of the above with the helpfulness and friendliness of the staff has rocketed this property to the top of our favourites list. Our only concern would be that you might miss the temples as once you’re installed, you’re not going to want to leave. At the time of writing, they were still offering soft-opening rates, with 25% off the prices quoted here. Keep an eye out too for special offers, when you may be able to pick up a pool view studio for less than half of the low season price below. The prices may change depending on the number of guests booked to the room. Last updated on 29th November, 2016. Check rates at Templation on Booking.com. Room: Standard double room, low season: US$190, high season US$220. Notes: Pool view studio.